If you see this error when you install Office, restarting your device and reinstalling Office might fix the problem. 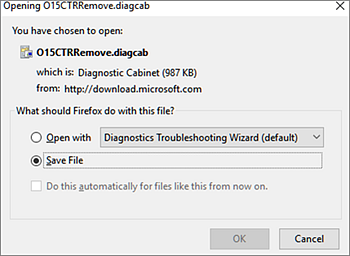 If that doesn't work, use the easy fix tool to completely remove Office from your device, and then restart the install. Note: This error may also occur if you're using the Office Deployment Tool to install Office 365 ProPlus. For more information, go to "Use a newer version of the Office Deployment Tool". You may see this error if you're using version 16.0.7118.5775 of the Office Deployment Tool to download and install Office 365 ProPlus. The download works OK, but when you run the /configure command to install Office programs, you receive the following error message, "We're sorry, we had a problem installing your Office program(s)."